Let me start out by saying that I LOVE Malice Domestic. Malice Domestic III was the very first mystery convention I attended, and as surely as the swallows return to Capistrano, I attend Malice each year, making this my nineteenth. So don’t expect a lot of criticism. This Malice was smaller than some years, but despite economic woes, the committee pulled it together and arranged smaller meeting rooms which made everything (appropriately) cozy without being crowded. They even negotiated a lower room rate than what had originally been advertised, which I call handsome. I started out the convention participating in Malice Go Round, which is kind of like speed dating for mystery fans. Every five minutes, a duo or trio of writers would visit a new table of fans and introduce themselves and their books, plus hand out cards/bookmarks/chocolates. Twenty tables, twenty repetitions of each spiel. It was fun, but by the end, I ‘d nearly forgotten my books’ titles, let alone what they were about. And I want publicly thank Monica Ferris and Kate Carlisle. Each table was supposed to have two authors, but I missed out on the fact that I was supposed to show up ten minutes before starting time, so by the time I got to the room, all the tables had two authors. I was told to pick one at random, and sat down with Monica and Kate, not realizing that would mean that they’d have their time shortened as a result. Monica and Kate had every right to resent my intrusion, but couldn’t have been nicer. So go buy their books! I was on two panels this year. First up was “Make it Snappy: Our Best Short Story Nominees” with all five of this year’s Agatha nominees for Best Short Story, along with moderator Barb Goffman (herself a short story Agatha nominee in 2006). So that meant that Dana Cameron, Jane Cleland, Carla Coupe, Nancy Pickard, and I got to talk enthusiastically about writing mystery short stories. What’s not to like? My other panel was “Wine, Flowers, and Murder: The Role Romance Plays in Mysteries,” in which moderator Dana, myself, Mary Burton, and Kate Collins talked about doing “it” on the page. Or, in my case, between chapter breaks. My characters are oddly shy. Of course, the big event at Malice is always the Agatha banquet. This year was a great one. First off, I was an Agatha nominee, which makes it fun. Second, I was sharing a table with fellow nominee Dana, who made up amazing gift bags for everybody at the table. (And let me throw in some pirate items.) And third, the people at the table were great fun, particularly Dana’s agent, the irrepressible Janet Reid. We played with toy werewolves from Dana’s gift bags, ate some pretty darned good banquet food, and laughed our tails off until time for the grand announcement of the winner of the Short Story Agatha. Which I didn’t win. Dana won, for “The Night Things Changed.” And I couldn’t be happier or prouder. Sure, I like winning awards. But I like seeing good stories win, and I like seeing friends win, and I really like seeing a story that Charlaine Harris and I edited winning. Dana’s story appeared in our anthology Wolfsbane and Mistletoe, which means Charlaine and I get a nice editorial glow from her win. I tried to convince Dana that Charlaine and I should also get the lid to the Agatha teapot, but she didn’t buy it, and she had a werewolf strike force on her side. Here we are after the Agatha banquet. 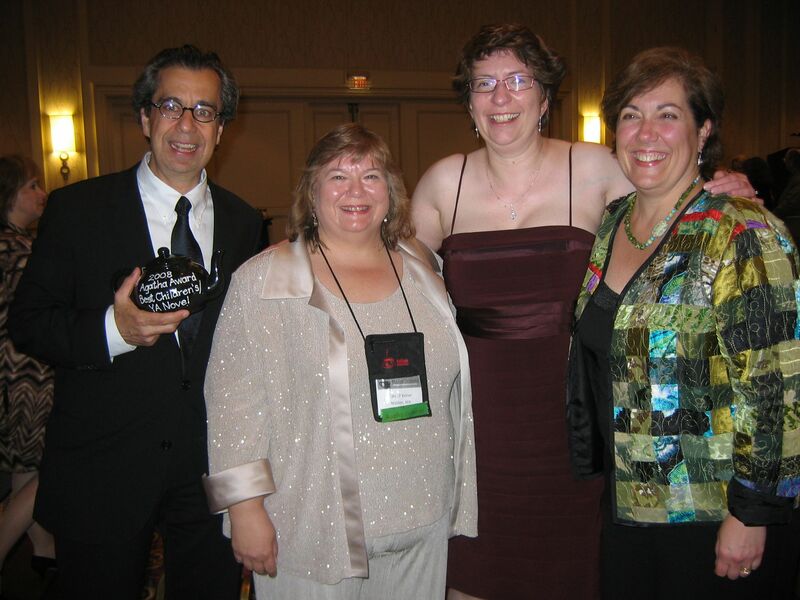 That’s Chris Grabenstein on the left, with his Agatha teapot for Best Children’s/YA Novel, me, Dana, and our fellow short story nominee Carla Coupe. Malice ended with the traditional tea on Sunday afternoon, and left me worn out but happy. I’ve already signed up for next year.